You really need to subscribe to this podcast! Great stuff! Hello! And welcome to the first episode of “Deep In Bear Country: A Berenstain Bearcast.” In this episode, I take you through the whole reason this thing even exists. I give you a little rundown of the history of authors Stan and Jan Berenstain and hopefully prepare you for the long LONG journey to come. 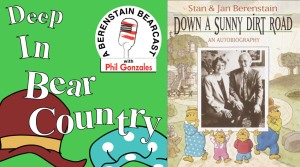 All of the biographical information in the episode comes from “Down A Sunny Dirt Road – An Autobiography” by Stan and Jan Berenstain. It’s an invaluable source of information and I’ll be covering it specifically in a later episode.